1F H3 H4D 0FF3R3D C4K3, 1 W0ULD H4V3 W15H3D 70 ______ 50M3. PL3453 H4ND 7H3 CH3CK 70 J0HN 0R ______. C0MPL373: ______ W0RD5 4ND M0R3 4C710N. "7H47 W45 4 N34R D154573R." WH47 P4R7 0F 5P33CH 15 'N34R'? WH1CH 0F 7H3 F0LL0W1N6 15 6R4MM471C4LLY C0RR3C7? Are you content with the idea of my going camping with you? Are you content with the idea of me going camping with you? 1 63NU1N3LY F33L ______ F0R Y0U, 8U7 Y0UR F47H3R ______ C4R3 L355. WH1CH 0F 7H3 F0LL0W1N6 H45 7H3 54M3 N4M3 45 4 80DY P4R7? 1F 1 ______ Y0U, 1 W0ULD QU17. 600D LUCK! 1 ______ F0R 7H3 8357 F0R Y0U. 1 H4V3 4 73RR18L3 H34D4CH3. 1 R34LLY N33D 70 ______ D0WN. 1 5W34R 1 DR1NK ______ 7H4N 51X C0FF335 4 D4Y. 7H3 V1C70RY ______ H4V3 833N 4 W473R5H3D 1N M0D3RN 4M3R1C4N H1570RY. 4F73R F41L1N6 7H3 7357, 7H3 57UD3N7 W45 ______ 1N 7H3 70WN 5QU4R3. You totally nailed it! You automatically read letter combinations and scan through texts without losing your focus. You like things to be perfect, and you want them neat and clean. Your most dominant obsession is with grammar. You're a spelling stickler! 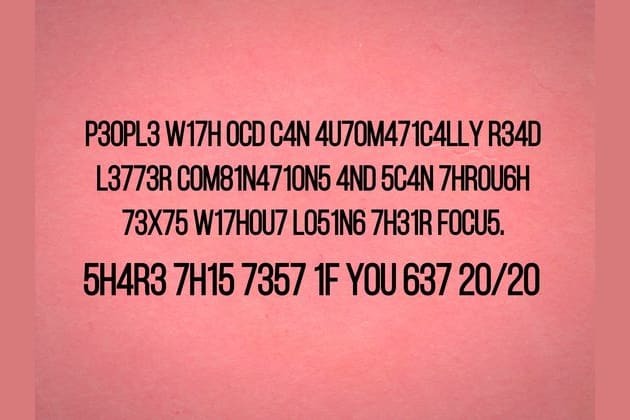 Share this OCD quiz to test your friends. You passed! You're a practical thinker. You have a purpose for reading, and you subconsciously monitor that purpose. You can easily catch satire and puns, and you usually predict what is about to happen in movies and books. Share this OCD quiz to test your friends. 5/15!! You do not have OCD!! You didn’t pass, but no worries. That means you have the soul of an artist! You organize information in creative ways and take NO notice of irrelevant data. Are we spot on? Let us know in the comments. There are some things that only people with OCD can puzzle out. If you're one of them, you won't have any trouble figuring this spelling drill out in less than 2 minutes.